A vigorous storm brought tornadoes and massive hail stones the central USA yesterday, 26 Apr 16. Cloud top pressure, courtesy of EOSDIS, computed from satellite imagery shows pressure of highest cloud visible to the sensor; the lower the pressure the higher the cloud. 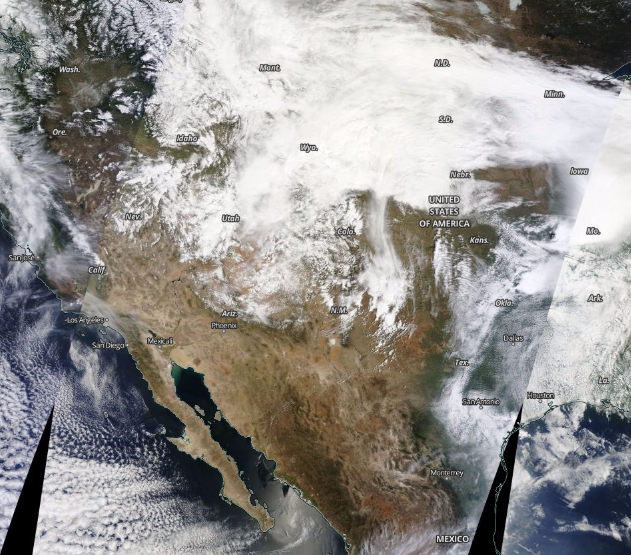 Desktop meteorologists can get a quick view of the tornadoes and convective storms that hit central USA yesterday, 26 Apr 16, by using NASA’s EOSDIS presented as the featured image to this blog. 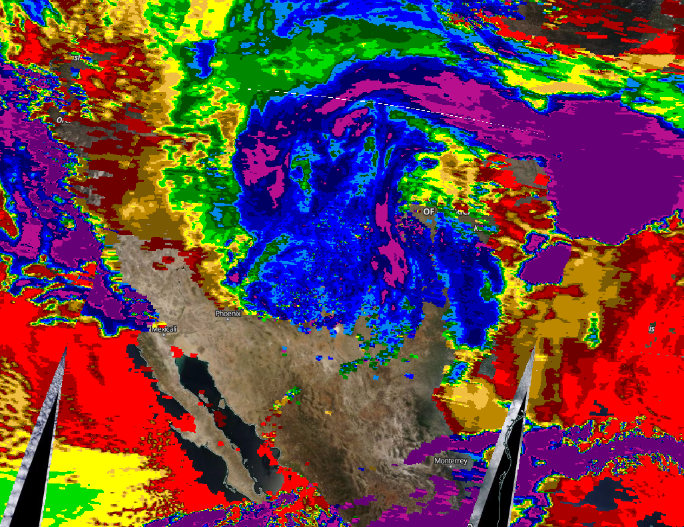 The purple mass in the top right hand area of the picture is very high cloud associated with this active storm system. Visual imagery is presented below. 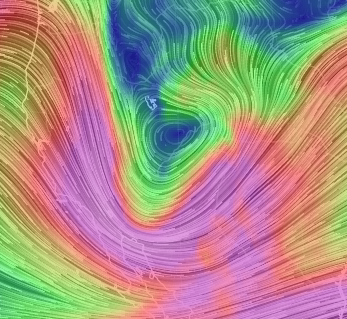 A look at the wind flow at 250 mb /30,000ft ish, using the Earth website, shows the region overlain by the exit of a powerful jet stream. Mathematical dynamics predict this to be aan area of strong divergence the result of which being the air is literally sucked up through the atmosphere from the surface causing these vigorous storms. 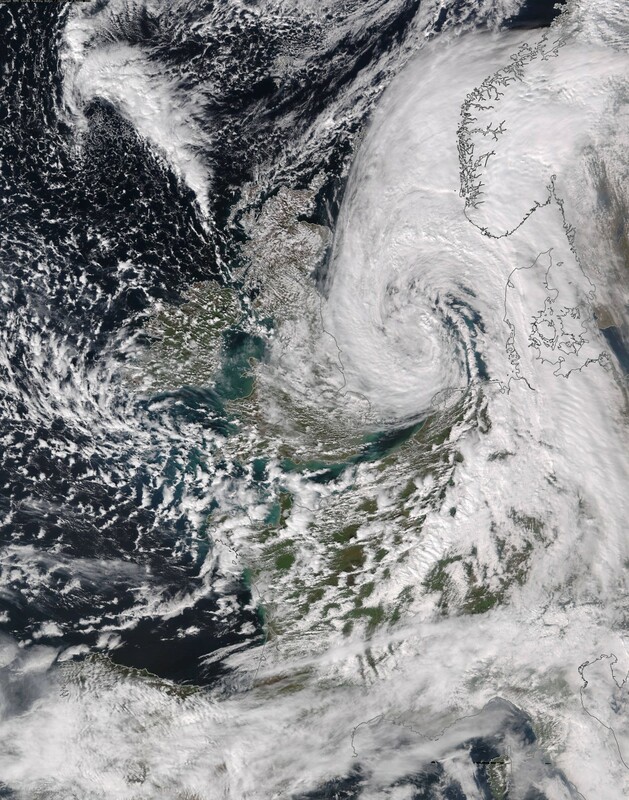 Are recent storms the consequence of climate change? This is always a hot media topic when we experience severe weather. Since weather is the result of the Earth system trying to breakdown temperature gradients between equator and pole, it does not follow that and overall increase in global temperature will lead to more vigorous weather. Downhill skiers go fast because of the gradient they ski on, the same gradient could be found high in the mountains as well as near the valley bottom. Sadly, the issue if complex and not understood fully yet. It was never going to be that simple yet byte size media demands such simplicity. Contemplation of the equations of dynamics on the surface of a rotating sphere subject to chaotic dynamics make this unsurprising. Computed calculations use curtailed floating point numbers, numerical weather prediction cannot even work with true values for irrational numbers like and and the departure from such values could trigger a ‘butterfly effect’. Sometimes a better maths and science education is required to understand how much we don’t know. As an operational meteorologist and synoptic weather watchers, I warm to Shepherd’s ‘storyline’ approach to analysis. Successful application in this area would lead to communicable cause and effect discussions. climate change’ as well as in sufficient ‘Quality/Length of the observational record’ to make the judgments anyway. Anthropomorphic climate changes is accepted, but this particular question remains unanswered. Author jpedPosted on 17th April 2016 17th April 2016 Categories climate change, depression, stormTags climate change, depression, meteorology, storm, Storm Katie, weatherLeave a comment on Are recent storms the consequence of climate change? 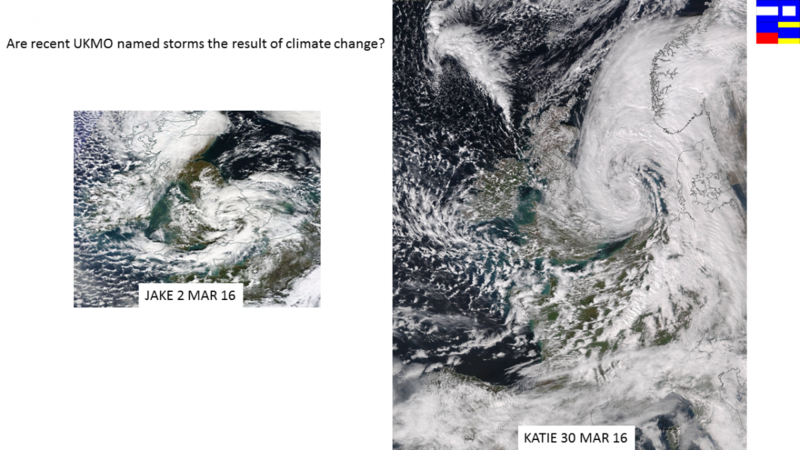 The meteorological event of the day, storm Katie, gives a dramatic signature on all the various meteorological graphics. MODIS channel 22 at 280230, Earthnullschool surface winds and UKMO surface analysis 280000 presented above. 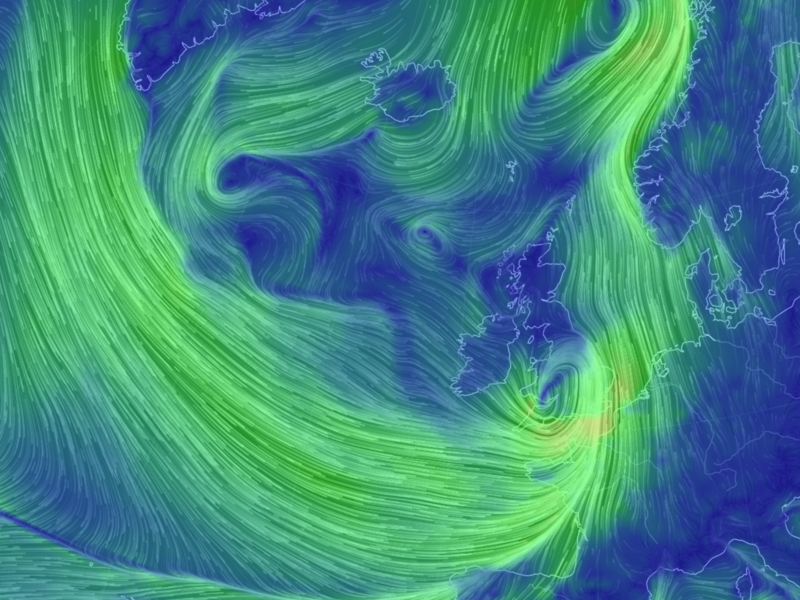 Surface wind flow from Earthnullschool shows the intense wind field over SE UK, squeezed ahead of the vortex, but the NW’ly surge of air from Denmark Straits is perhaps the most striking element of this graphic. The storm is a snag in a larger complex depression which mixes cold air from the pole to the West and warm air up to the East. By this method, the atmosphere does its job of breaking down the temperature gradient from equator to pole and illustrates one of the keys to meteorology. Atlantic Hurricane season starts on Wednesday, first of June, what’s in store? Mathematics Teacher, Royal Naval Officer, sometime Meteorologist. Like cycling, walking and sailing.